There was a time when an AR15's handguard served one purpose, to keep flesh from contacting the hot barrel. Eventually as the AR15 became more popular and AR15's became target rifles for civilian and military shooters alike the free floating handguard was born. A free floating handguard is designed in a manner where the handguard is secured to the receiver but never actually touches the barrel to influence the rifles accuracy. 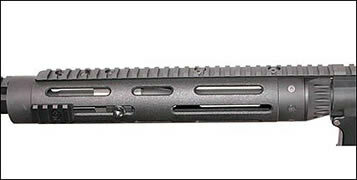 Moving forward modern manufacturing process have made it possible for yet another style handguard to come to life. The handguard's are of the tactical nature integrating picatinny rails on one or several locations around the handguard's circumference. Depending on the manufacturer and use these handguard's may also be free floating. The purpose of these han guards with picatinny rails is to permit a multitude of weapon accessories to be mounted to the firearm to make it suitable for a given task. These accessories might include secondary optics, lasers, night vision, tactical lights, bipod's and much more. 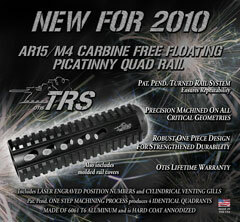 The integration of the picatinny into the handguard is a blessing to those who like to accessorize their firearms. For our purposes we will examine both styles of handguard in this section. The Patent Pending Daniel Defense Omega Rail™ system is the most exciting rail system to hit the market in years! 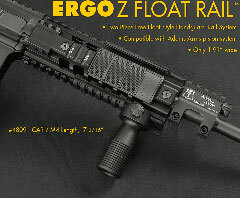 The Omega Rail™ is free float rail system that allows the individual operator install it with the Allen Key provided and requires ZERO modification to the weapon! The Omega Rail™ features an integral QD sling swivel mount with rotation limiter and an uninterrupted upper rail platform. This light weight rail system is meticulously CNC machined from Aircraft Grade Aluminum and is Military Specification Type III Hard Coat Anodized. All the Omega Rail fasteners are military specification. 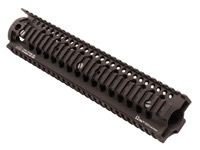 The Omega Rail 12.0™ is designed to work with rifle length AR15 gas systems. It is not to be used in conjunction with a low profile gas block or shorter length gas systems. All Daniel Defense Rail Systems are built to the 1913 Military Specification and are 100% Quality Assurance checked for conformity to the specification. 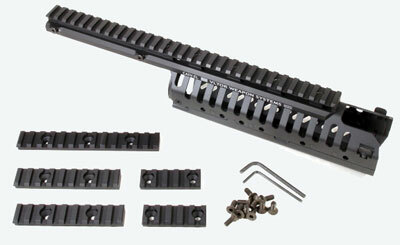 The Omega Rail™ comes standard with three black ladders to protect the 1913 rails as well as the shooters hand. The Ladders are constructed from santoprene, which can handle heat up to 350 degrees. Safety: Depending on the optic/sight setup, it was possible to grab the rifle in such a way as to touch the hot gas tube with our first generation hand guard. We have changed the outer nut design and tube completely shielding this area to prevent this from happening. The new nut also completely covers the transitional area between the receiver and nut, preventing the exposed tube from being crushed if the rifle is dropped on a rock in just the right manner. The chances of this are remote, but in a place like Iraq, anything can happen. A fringe benefit of this new design is the reduction of the thermal optical distortion effect from hot air off the barrel/gas tube rising in front of the scope or sights under calm conditions. Precision: The tube is now secured to the outer nut with six flathead screws for a rock solid relationship that will never turn and remain precisely aligned to the upper receiver. Thus, any accessories such as secondary sights, co-witnessed sights or tactical lights stay in precise relationship to the upper receiver improving accuracy and hit probability with those accessories. Versatility: We’ve designed full-length, carbine, mid and rifle rail systems that extend the upper receiver rail interface forward at 12:00 on the hand guard, allowing for the use of co-witnessed IR equipment, secondary sights or flip-up iron. 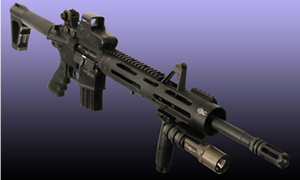 We also offer carbine and mid-length versions of the JP/VAC Modular Hand Guard System. These accessories allow a rail configuration for virtually any possible accessory combination. Integrity: This design features a dual-nut system with a 6061 T6 outer receiver extension nut combined with a carbon steel internal barrel retainer nut that can be secured with a standard M16 armorers wrench. This improves the overall structural integrity of the barrel/receiver relationship and makes it possible to achieve a precise 12:00 index of the tube regardless of where the internal nut needs to be for proper torque. If you look at many of the hand guard systems on the market nowadays, most have permanent rails at the 6:00, 12:00, 3:00 and 9:00 positions. Typically, you only need one or two sections of rail, and in many cases, they are best utilized at the 1:30 or 10:30 clock positions, not 9:00 and 3:00. Having to deal with the weight and uncomfortable feel of all these rails where you don't need or want them is not acceptable. These are just another example of products designed by people who are not real shooters for customers who just want their gear to look cool and don't actually use it. The JP/VTAC system allows for complete flexibility. You can use as many rail systems of whatever length makes sense when and where you need them and can forget about rails you don't need. That's versatility! Free floating tubular hand guards for the AR-15 offer the greatest improvement in accuracy of any single modification. In addition to overall accuracy improvement, point of impact will not change regardless of how the rifle is being shot, whether with a bipod, sling or hand held. Assuming a good barrel and ammunition, it's not uncommon for accuracy to improve from 1.5 -2.0 MOA to sub-MOA with a properly installed free float tube. The JP/VTAC modular hand guard is designed as a complete system to improve not only the accuracy but the handling characteristics and utility of the rifle. The floating studs included allow complete flexibility in bipod positioning, whether all the way out for maximum stability or all the way in next to the receiver for fastest possible target indexing. Extra studs allow for proper tactical sling setup as well. I used the VTAC in this build project. Highly versatile accessory rail/free-float handguard system mounts "piggyback" on the receiver rail of your flattop carbine to provide 12" of elevated rail space. Five additional, bolt-on Picatinny rails can be installed on the handguard at 3-, 6-, and 9-o'clock, plus two lower 45° positions, so you can add, remove, or reposition rail space depending on specific mission requirements. Includes one 6" rail, two 4" rails, and two 2" rails for mounting lights, laser sights, vertical grips, bipods, and any other accessories requiring Picatinny rail attachment. Lower half of handguard detaches easily to allow mounting of an M203 grenade launcher. Entire assembly installs in minutes directly to the receiver rail and barrel nut, so it places no stress on the barrel itself. Delta ring and factory gas block front sight may be retained, but gas-block mounted sling swivel (if present) must be removed. Anodized aluminum construction with stainless steel mounting hardware adds less than 1 lb. to total weight of firearm. Available in all-black or two-tone tan/black scheme that blends well with many desert camo patterns..
SPECS: Aluminum, hardcoat anodized, black or two-tone tan/black, matte finish. 13-7⁄8" (35.2cm) OAL, 2-1⁄8" (5.4cm) wide, 2¾" (7cm) high without bolt-on rails attached. Fits rifles with carbine-length gas systems only. Kit includes handguard/extended top rail assembly, (1) 6" accessory rail, (2) 4" rails, (2) 2" rails, (11) 10-32 hex-head mounting screws, (2) hex wrenches, and installation instructions. Falcon Industries has two capable offerings. One is a sturdy free float design and the other a replacement for A2 handguards. Machined aluminum carbine-length handguards expand accessory mounting options for your rifle and don't require barrel removal to install. Four MIL-STD 1913 Picatinny rails enable easy, secure mounting of lights, lasers, vertical grips, backup sights, bipods, and other accessories. 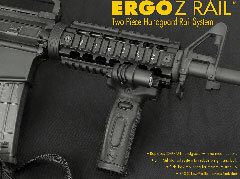 Z Rail is a drop-in replacement for an M4/CAR-15 carbine handguard and requires no modifications to weapon to install. Exclusive side lock system ensures a stable, rattle-free installation. Z Float Rail clamps to the barrel nut and free-floats your barrel for increased accuracy; requires permanent removal of delta ring. Has enough internal clearance for use with the Adams Arms piston system. Both handguards feature a black, hardcoat anodized finish for excellent resistance to surface wear, and include a set of snap-on ERGO LowPro Rail Covers that protect unused portions of the rails and give the operator a smooth, comfortable grasping surface. I have not seen this in person. Includes laser engraved position numbers and cylindrical venting gills. Patent pending one step machining process produces 4 identical quadrants. Made of 6061 T6 aluminum and is hard coat annodized. One-piece free-float handguard uses an extra-long barrel nut that provides extra strength and rigidity to ensure proper barrel float and an ultra-stable accessory mounting platform. Four MIL-STD 1913 Picatinny rails accept a variety of tactical accessories, and there's plenty of internal clearance for gas piston conversion systems. Barrel nut also allows easy indexing of top rail with receiver rail to provide a long expanse of uninterrupted mounting area for optics and backup iron sights. Laser-etched position marks aid in fast reinstallation of optics and accessories in the right place after temporary removal. Available in Carbine (7"), Mid-Length (9¼"), or extended Rifle (12½") lengths for plenty of versatility. Multiple lightening cuts and oversized vents keep weight down without sacrificing strength and improve air flow for efficient barrel cooling. Barrel nut easily attaches to receiver with a standard spanner- or strap-type barrel wrench. SPECS: 6061 T6 aluminum, hardcoat anodized, matte black. 2" (5.1cm) wide, 2.4" (6.1cm) tall. Available in Carbine - 7" (17.8cm) long. Mid-Length, 9¼" (23.5cm) long. Rifle – 12½" (31.7cm) long.